Welcome to the final component in our three week Mobile Recruiting excursion. At this point, we’ve built a pretty solid case for mobile optimization with percentages to support most employers’ target demographics and we’ve also debunked a lot of the myths surrounding where job seekers begin their job search. Now that the whats and whys of mobile recruiting are out of the way, it’s time to for the piece de resistance. I’ll walk you through some simple and key adjustments to make to your career site so you can attract the largest pool of qualified applicants with an optimized mobile approach. This means that everything on your Career Site currently (open position titles, job description, company information, etc.) should be formatted to respond and automatically adjust to whatever device your job seeker is using whether it’s a smartphone or tablet. Stay away from Flash and don’t use excessive text. You can use videos and pictures to replace some of the excised text, but ensure that the media is small enough to load quickly on a 3G connection. Lastly, confirm that all of your links/forms function properly. There are two key components to this. The first involves eliminating excess screening questions that are unnecessary. I know that this makes a lot of HR Professionals uncomfortable, but you’d be surprised at how many of my clients don’t even know what questions are on their applications. Most of their applications are the same ones used from twenty years ago. The key is to use “smarter” questions that are weighted and will assign a value to your applicants; this is something that comes standard with a great hiring software like ApplicantPro. Secondly, either eliminate the need for a resume upload by including the option for your candidate to list their LinkedIn profile information (which allows you access to their resume), enable your resume upload to be jpeg compatible so the job seeker can send a picture of their resume or use an app like GeniusScan to send a PDF, otherwise, exclude this step altogether by relying upon your intuitive screening questions to assess their compatibility and have them email their resume or bring it with them if they are selected for an interview. Chances are, especially if your candidate is in high demand, he/she will want a confirmation that the application was, at the very least, received. This is especially essential for mobile users since most everything we do on a mobile device lets us know that we did everything on our end properly. Think about it this way, you ALWAYS receive a receipt or validation after you make an online purchase because it affords you the peace of mind that your transaction was processed correctly. The same can be said for when you “register” for anything. You’ll receive an automatic responder that includes something along the lines of “thank-you for registering for such and such, we’re happy to have you.” People expect the same level of engagement for anything online that involves them divulging their personal information. 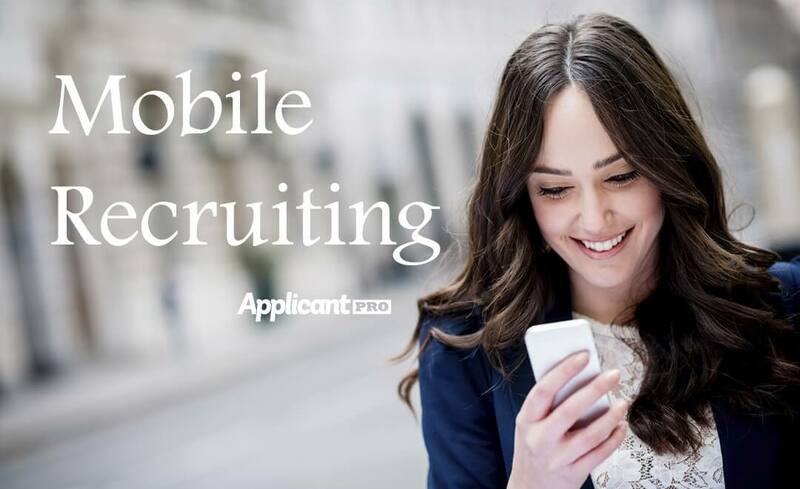 If you have any questions about how an applicant tracking system like ApplicantPro can make your mobile recruiting efforts seamless, please contact us today.